This course outlines the basic sanctions imposed under Circular 230 and the process for imposing them. 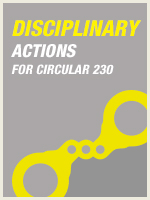 More importantly, the material digests dozens of disciplinary cases instituted under Circular 230 and categorizes the specific types of conduct leading to sanctions. Upon completing this course the practitioner will have a firm grounding in the patterns of activities that are likely to result in disciplinary actions, those defenses that may be successful, and the excuses that do not work.